I am sure that many brides thought about the way their wedding dress is going to look like since they were children. And I am also sure that there are as many brides who want to make sure their wedding dress is unique and personalized. If you are one of those brides, you can always decide to design and make your unique wedding dress. If you do decide to make your wedding dress, here are some questions you must ask your seamstress. How long it will be for the dress to be ready? 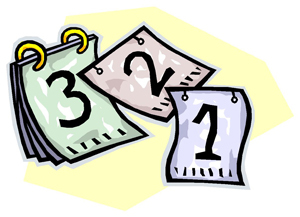 On average, a wedding dress should be ready in 6 to 8 months since the day you ordered it. If your seamstress says it’s going to take longer for the dress to be ready, it’s a sign you should change the seamstress. How many fitting sessions will be? If you chose a dress from a wedding gown store and you just need to make it to fit your body will need up to three fitting sessions. But if you have a new design drawn on a paper and you want a seamstress to make it from scratch you will probably need 6-8 fitting sessions. At the first fitting your seamstress will assess what needs to be done, if the hem is too short or too long, if the dress is making any creases. At the second fitting you will see if the previous changes look good now and if you need any other adjustments. At the last fitting the dress should look as for your wedding day. Make sure you take your maid of honor with you to give you her honest opinion on the look of the dress. The fitting sessions should start with 6 to 8 weeks before the wedding, so that there is enough time for the seamstress to make the adjustments. Are the adjustments included in the gown’s price? 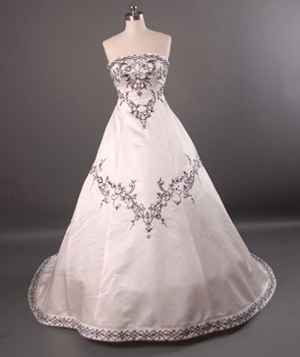 Some wedding gown stores who also make the wedding gowns have the adjustments included in the gown’s price. But if you are choosing a private seamstress you might have to pay extra for any adjustments that need to be done for you bridal gown. 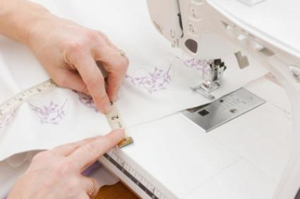 There are also stores that do not make any adjustments at all, but recommend you seamstresses that you could use. Can I personalize every detail of my wedding gown? The answer to this question varies depending on the designer or the manufacturer. Some offer unlimited options while others don’t allow you to change anything. If the answer is a “No” you should take your bridal gown design and go somewhere else where you are allowed to personalize it in any way you want. 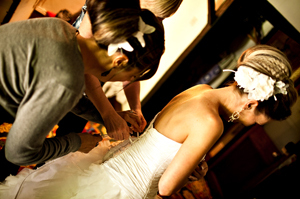 The seamstresses are used with weight fluctuations of the future brides as long as the changes are not extreme. 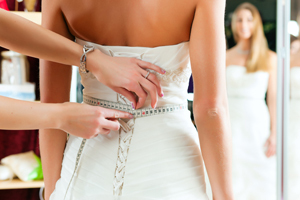 So if you lose or gain some weight right before your wedding your seamstress should be able to make all the adjustments needed for the dress to look perfect on you on your wedding day. Will the cost of the fabric be included in the cost of the dress? Some retailers expect you to pay a different amount of money for the fabric and the accessories needed in order to make your dress. If this is the case, the final price of the gown might be a little higher than you expected. Make sure you talk to the seamstress and establish what exactly includes the price of the dress and if you need to pay extra for anything else. Will the corset of the dress be integrated in the dress? The bridal gowns that have the corsets integrated tend to define better the bride’s silhouette. Also, bridal dresses that have the corset integrated might require special lingerie for a perfect look. If the corset and the skirt are two different pieces make sure you have a design that matches them both. Most of the time you have to pay up to 60 % of gown’s price in advance, when you make the order. If your retailer asks for more, this should be a sign that something is wrong, and that you should find a different seamstress.